Publishing giant Activision Blizzard is set to make a round of layoffs in the next few days. That's according to a report from Bloomberg, which claims that the Call of Duty and Overwatch firm is going to be announcing the cuts on Tuesday, February 12th. This figure could likely be in the hundreds as Activision tries to boost its profits. There's no indication which parts of the games giant are going to be affected by these layoffs. 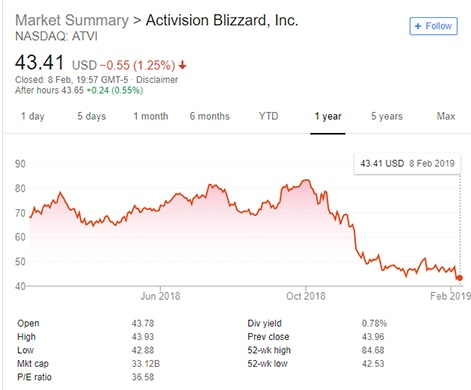 No doubt we'll find out more about the job cuts during Activision Blizzard's investor call on, um, Tuesday, February 12th. These job cuts are likely driven, in-part at least, due to new releases - namely Destiny's Forsaken expansion - failing to meet the publisher's expectations. Activision Blizzard has since parted ways with Destiny maker Bungie. While losing this IP will reduce operating costs, the firm can no longer count on the millions that franchise would bring in each year. This decision might cost the publishing giant even further, with several class action lawsuits in progress right now with investors who have suspicions about this deal. Meanwhile, growth on existing titles - including Hearthstone and Overwatch - has started to wane; during the firm's last financial call, the former's MAU figure was down year-on-year, while the user base for Blizzard's hero shooter remained flat. There have also been reports of cost-cutting at Activision Blizzard, with the folks upstairs looking to focus on new IP that will generate steady revenue. There are certainly anxieties internally, too, that the billion-dollar franchise focused Activision - a company that now boasts one big franchise - is taking the reins more. The fact that the CEOs of both Activision and Blizzard - Mike Morhaime and Eric Hirshberg - have left the company in the last year, as has its CFO as well as Mike Condrey and Glen Schofield, the founders of Call of Duty WWII maker Sledgehammer Games, who were set to take exec positions at the Big A isn't a great sign, either. Oh, and apropos of nothing, Activision's new CFO Dennis Durkin received $15m for taking on that new position.